If you have been reading our Blog, you will know that we have been working on our first Plush bear and we were only going to offer him for sale if we were pleased with him, as he was a bit of an experiment! However, we love him and are delighted to offer him to you here. He is called Dumpling, as he is part of our Apple varieties collection. He is 21" tall and looks bigger because the gorgeous luxurious plush fur is very, very thick. It is also soft and silky, really gorgeous to touch. Dumpling is softly filled with polyester stuffing and plastic pellets so he is squashy and has a little weight because of his size, but he is not as heavy as our mohair bears. He has a sweet button nose rather than a stitched one, his eyes are black German glass and his pads and paws are made of the same lovely fur as his body and ears. To give him added charm, he has bells inside his ears, so he jangles when he moves. I do hope that you like him, he is very sweet with a lovely face. As explained in the Blog, the advantage of this new generation of Plush, is that it is of a far higher quality than the old type of plush, but is still a fraction of the price of mohair and alpaca, so we are able to offer Dumpling for sale at the modest price of £96 plus postage. 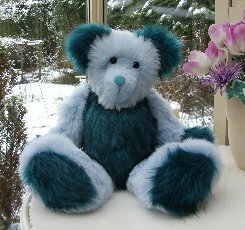 A mohair bear of this size would cost around £230, so it is quite a saving and it gets you a great big bear which you might not ordinarily be able to afford. Please note that as with all our bears, Dumpling is not a toy and is not suitable for children. Sorry - Dumpling has been adopted.